On March 22 every year, World Water Day is celebrated. The motive behind observing this day is focusing on the significance of water and need to conserve it. The theme for this year is "Leaving no one behind". The first World Water Day was observed by the United Nations General Assembly in 1993. This year is 26th World Water Day. On this occasion, Sudarshan Pattnaik, internationally renowned sand artist, shared a message to conserve water through his sand art. World Water Day 2019 Theme, Significance and Interesting Facts. Pattnaik through his sand art spread the message of "Save Water Save Life". The Padma Shri awardee sculpted a minor thirsting for a droplet of water. "Every drop of water is important for the survival of living beings on our earth. 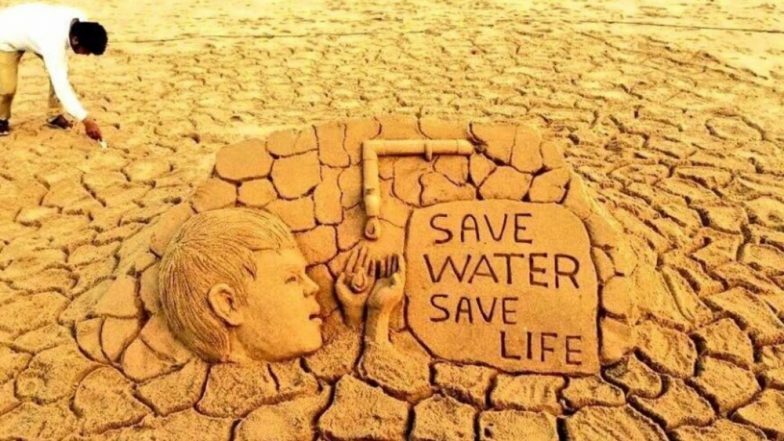 #SAVEWATER #SAVELIFE I am sharing one of my SandArt On the occasion of #WorldWaterDay," he wrote. Where Did Water Come From? 11 Unusual Facts About This Life-Giving Substance. World Water Day is celebrated to tackle the water crisis as the central promise of the "2030 Agenda" for Sustainable Development: as sustainable development progresses, everyone must benefit. The theme "Leaving no one behind" tries to raise awareness that water should be available for all. To save water, you can make an advance with small changes in your daily life. One can use drained water from RO filters at home for mopping the floor. Water used for rinsing the vegetables can be used for watering the plants. Just a small step in the daily routine will have a big impact on conserving the water for the next generation.